More and more builders are interested in building a wooden house. This is a very broad concept. It only says that the structure of a house is made of wood. This can be the case with a half-timbered house, as it is with a house made of natural trunks. Their diversity could hardly be greater. In many cases, this means today a prefabricated house, which is built in Holzständer- or Holztafelbauweise and therefore also counts among the wooden houses. But there is also increasing interest in the classic log cabins and the round and natural log houses, as very natural and original wooden houses. The motives to become interested in a wooden house are manifold and very different. 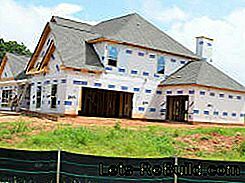 Many people are simply looking for cost-effective solutions to finance a home construction. Others have a preference for a particular style. You may dream of an open veranda and want to build a house in the American style or in the Scandinavian, such as a Schwedenhaus. Before you build, you should first analyze what you need. Realism is always a good foundation for a home. Therefore, it is advisable to analyze in the first step always exactly what options and what needs we have to consider when building a wooden house. The possibilities will usually be limited. From a budget, the location and size of a plot of land from the provisions of a development plan or other, personal circumstances. Define exactly this frame for yourself. Analyze your current as well as your future needs. This concerns space requirements, special requirements (eg accessibility) and, for example, the number of bedrooms required. Distinguish needs from wishes. You will find the potential for savings and compromises. Many modern houses do not look at the construction at first glance. As always and everywhere the offers differ in quality and price considerably. Overall, the quality of new buildings has changed positively in the last 15 years. This is mainly due to the energy efficiency standards that were required in terms of funding. Especially wooden houses could easily reach these standards with comparatively low construction costs. The building material wood is simply superior to the stone in terms of its thermal properties. In addition there is the usual insulation in many types of wood. Nevertheless, there is no simple judgment as far as solid construction and timber construction are concerned. They differ in different ways. Therefore, it is important to deal with the advantages and disadvantages of a wooden house in advance. The different types of wooden houses differ considerably. There are also other major differences in quality within the wooden houses of the same type. Nevertheless, it helps to be aware of the particularities of the individual wooden houses in order to make general decisions in advance. 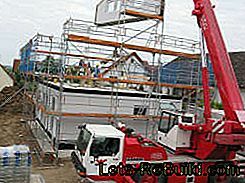 A prefabricated house is set up quickly. 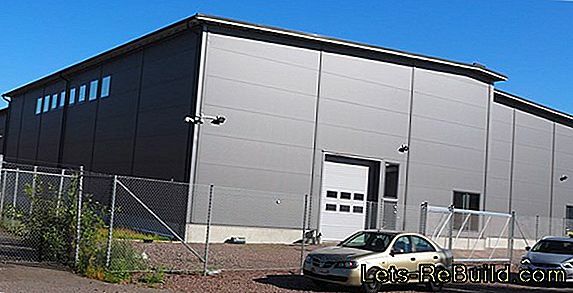 These construction methods are used both in prefabricated houses as well as in a construction directly on the site. 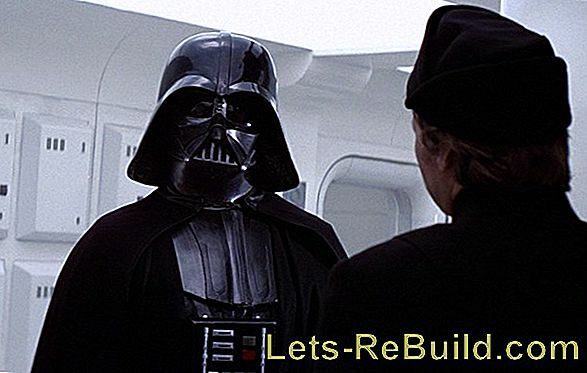 The terms are sometimes used synonymously (for information on timber stand construction here). These terms are understood to mean a construction based on wooden beams that form the skeleton, which are then insulated and covered with various materials. 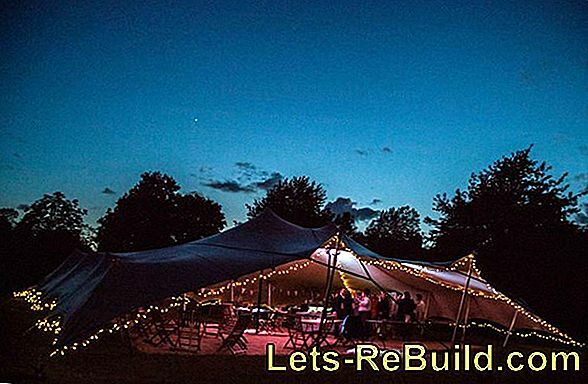 In many cases, entire walls, ceilings or roof parts are delivered completely prefabricated to the construction site, so that their construction takes only one to two days. Blockhouses are still predominantly to be seen as a garden or holiday house. The log cabin actually belongs even more in the previous category of a timber frame house. Only the facade and - in the best case, the inner walls - consist of more or less thick planks. Both the facade and the interior wall are connected to a frame made of wooden frames and there is an insulation between the two layers. For the assessment of quality and properties, the strength of the planks inside and out is crucial. 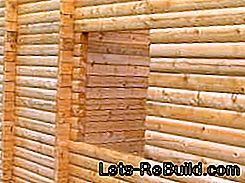 In contrast, to the block houses described below is not a log cabin, but has less than seven inches of board thickness also not the same room climate, like a real log cabin. In Canada and Scandinavia, log houses are more common as homes. 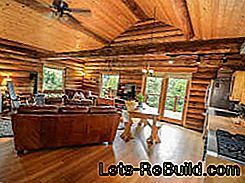 In real log houses, the walls consist of whole beams or trunks, which lie as close to each other as possible. The strength of the logs or trunks is at least 18 cm or at least 21 cm for round trunks. 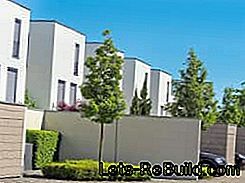 The quality of the houses is heavily dependent on a dense processing. Weaknesses are classically the corners. One of the peculiarities of the Bockhäuser is that the whole house, especially in the first three years still sets. 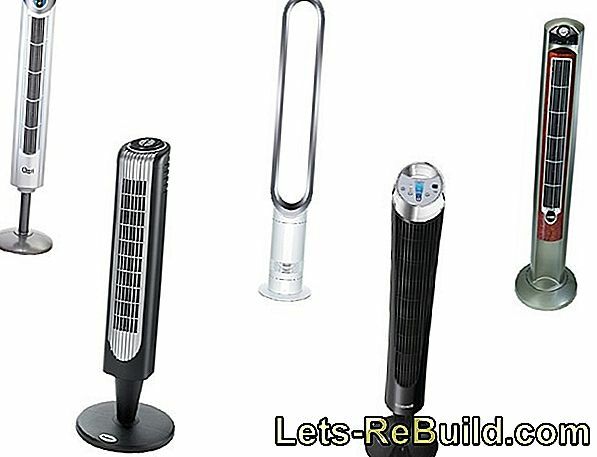 Therefore, installations of all kinds have to consider this peculiarity from the outset. For baths, this is realized by hanging walls, to be mounted on the sink, etc. During electrical installation, cables are laid with a little extra, so that they can join in the movement of the wood. The current wooden stand construction comes from the framework. Even a half-timbered house or a Umgebindehaus belong by definition to the wooden houses, play in the today's house construction however practically no more role. Nevertheless, both types of buildings in our country are witnesses to the durability of wood as a building material. 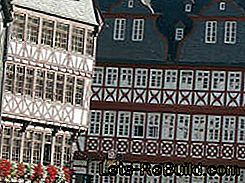 Especially the tall half-timbered houses in historic city centers impressively demonstrate how versatile timber construction can be. In the farest also include pile dwellings to the wooden houses. 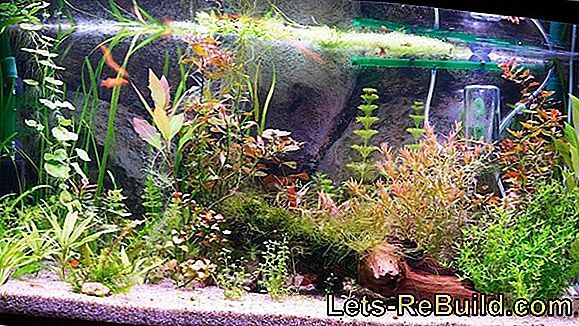 They also show that there are woods that can survive even in the water for a long time. 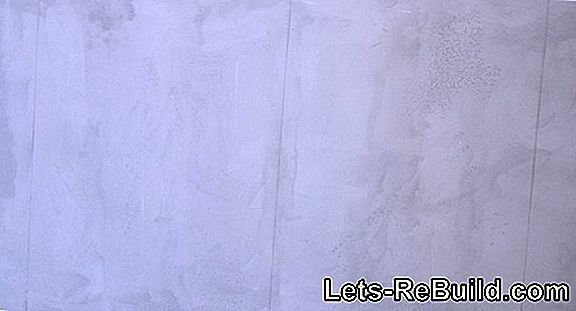 References are good. The own impression locally but more valuable. As far as the comparison of providers is concerned, their references can be as important as their personal impression. Various magazines have made comparisons. There are also reports from builders. Last but not least, you can get an impression of model houses and consultancy talks. 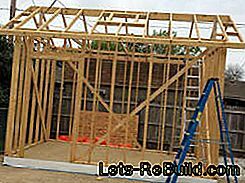 Smaller wood construction companies (carpentry) often offer a very solid quality craftsmanship and can respond to any individual wishes of the builders. They usually have neither model houses nor extensive sales material. Ask for references and inquire there. Do you have some wooden houses in your area? Just ask the homeowners about their experiences and where their wooden house comes from. Because on the Internet are often only the dissatisfied voices, while the satisfied ones are no longer busy with the topic and turn to other things. As far as the offers themselves are concerned, it has proved useful to transfer the individual items of the respective terms of reference into a table and thus make it easier to compare them. At the same time, it is a good tool for identifying missing information or services. The price depends on the size and the demands. The prices for wooden houses are very different. Wooden house / prefab house prices can be very cheap, for example, 30% less than a comparable solid construction. A prefabricated house will be particularly inexpensive, if not many changes in the floor plan and special requests are added. 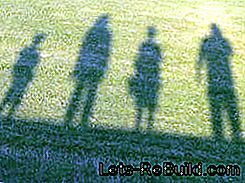 If you are skilled in craftsmanship and have some strong helpers, you can build with a development house or a kit house with a small budget. However, this requires an immense double burden over a longer period of time. If you build your own timber house, the price is not the only criterion. There is a risk that the builders themselves overestimate their own capacities and abilities. In addition to the dangers that are assumed, self-induced construction defects can entail considerable costs in the long term. More about (wooden house) bungalow can be found here. 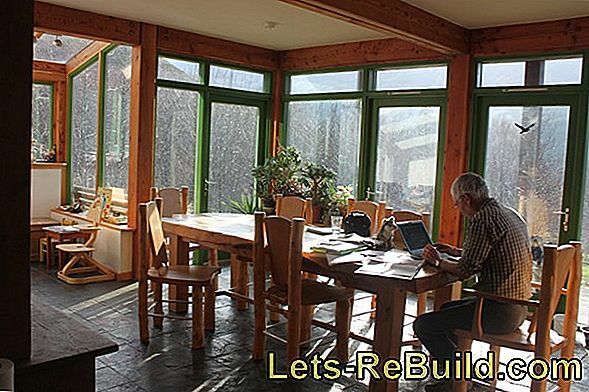 If, above all, the question arises for you how you can build a low-cost wooden house, then you have, for example, opportunities for your own contribution or even savings potential of a different kind. 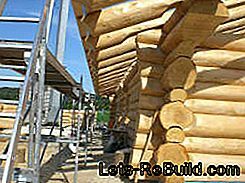 Check whether on your property the development plan allows a wooden house or a log cabin. When planning, make sure you have constructive wood protection (eg roof overhangs). Think carefully if you want to paint the wood, because then this can be repaired or repainted in many care intervals. Do not dispense with a blower-door test that detects the tightness. Pay attention to a structure of the floor slab to Passivhausstandard. The denser the house, the more important the ventilation. Ventilation is very important for all construction methods according to current energy standards. In a diffusion-open design, the question of a forced ventilation by ventilation system is less urgent. Regular airing is still recommended. 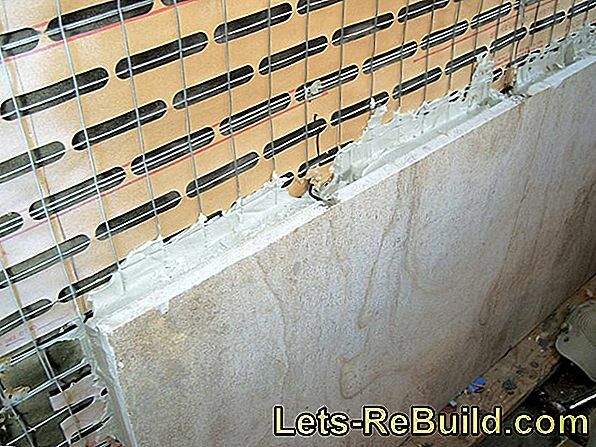 Who builds with vapor barriers (special films) for which is a really sufficient and controlled ventilation by ventilation system the best protection against moisture and mold damage. 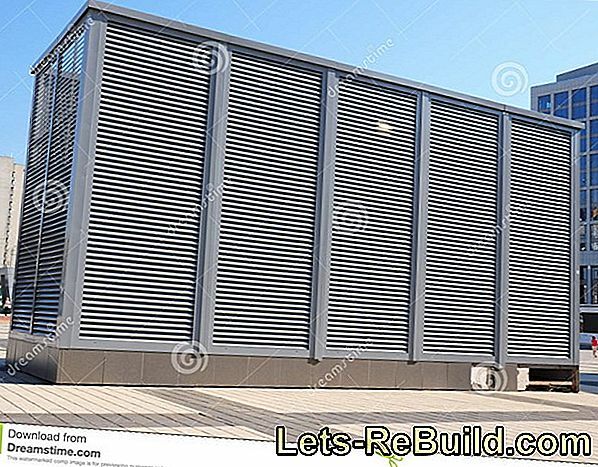 Moreover, a heat recovery system is usually connected to such a ventilation system, which extracts the heat from the used air and gives it back to the supplied fresh air. In summer, the process is reversed. Such a system should be maintained regularly along with pipes and cleaned, so they do not unintentionally for the spread of spores u. Ä. contributes. 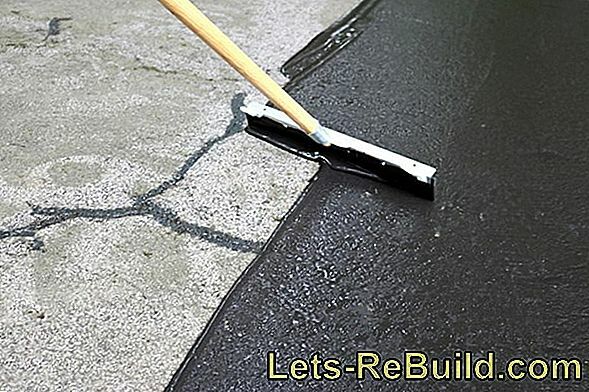 Garage floors may only be treated with garage paint. 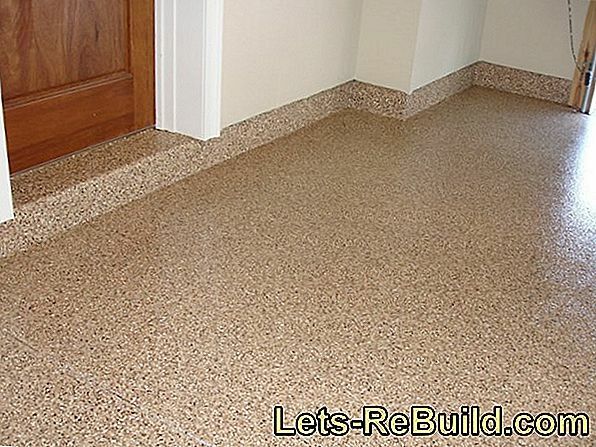 This guide shows you how to paint the garage floor made of concrete and cement screed. 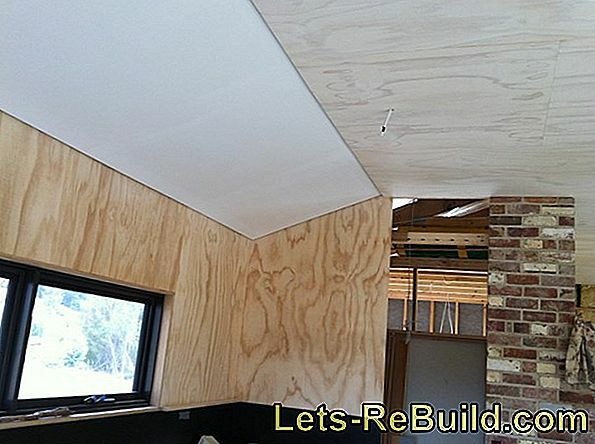 Lime walls: use lime plaster and lime paint to combat mold. Use lime for wall decoration and benefit from the natural mildew protection. 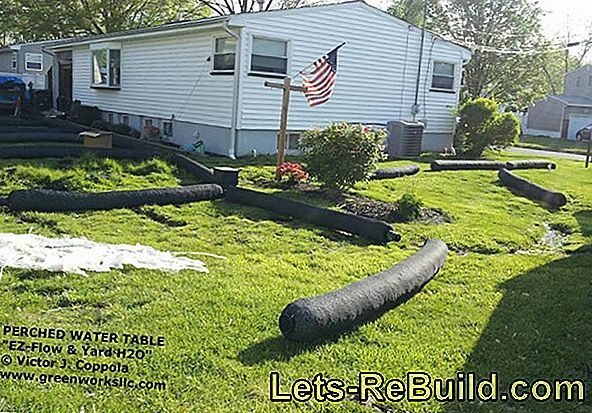 ➤ current sand filter system comparison 2018 on lets-rebuild.com. Compare now and get the best sandfilteranlage! A solar system for solar heat recovery consists of the sunlight collector, a control and a hot water tank with connection to the normal heating. Builders should take the opportunity to optimally coordinate home technology and solar technology. 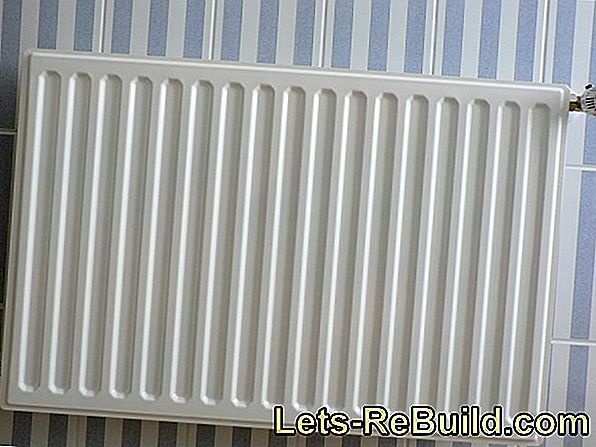 Even without major investments, heating costs can be effectively reduced. With our 10 tips, you get the most out of your heating energy. 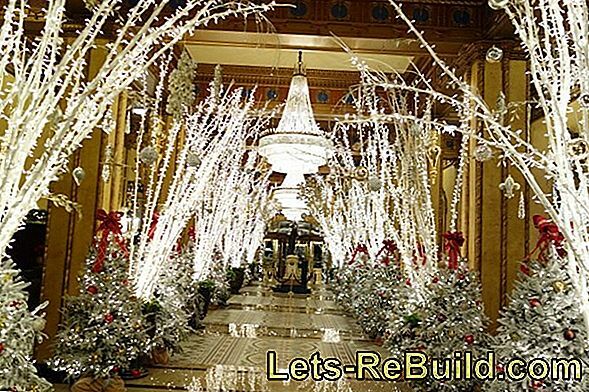 ➤ current fairy lights comparison 2018 on lets-rebuild.com. Compare now and order cheap top fairy lights! A wireless light chain is a practical alternative: we explain advantages and disadvantages, how it works and how safety is concerned. Leaky drainage pipes smell and leaking sewage leads to damage to the facility. It means acting fast. How, we tell you. Facade paint: properties and use. A tabular list and overview of the color properties of the most important façade colors: synthetic resin silicone resin paint, silicate paint and emulsion paint. This is how the lotus effect works, vividly shown in pictures: a raindrop rolls over the surface and absorbs dirt particles. The surface is clean again.